Batman/Superman paved the way, however, for the far more enduring Superfriends run from 1977 onward. This series featured not just DC’s biggest guns, but many of the second-tier heroes who would never get a look in of their own, like Hawkman, or Aquaman. No really! I can do stuff! I’m really useful! The show (initially The All-New Superfriends Hour) featured much of the same voice cast, and cemented the members of the Justice League as the favored in most homes with toon watching kids. Batman and Robin were, of course, heavily featured players in these, but were nonetheless part of an ensemble. But they were in no way suffering from overexposure, so another series was commissioned at the same time, this one to be wholly devoted to the exploits of Gotham’s Dynamic Duo. The New Adventures of Batman took its cue from the comic stories of the 50’s and early 60’s: Batman and Robin in space, fighting shape-shifting imps from the 5th dimension with utility belts that included a drunken Irish leprechaun playing the piano if the situation called for it. Let’s face it – it’s pretty well established that kids will watch anything (how else do we account for the popularity of YouTube? ), and being still in the early years of broadcast television, it’s not like there was extraordinary quality to compare with the early cartoon superhero efforts. These shows introduced so many youngsters to a perhaps overly friendly version of The Dark Knight. So, perhaps, the Slightly Dim Knight, then? What these shows had in common was a simple approach to writing, by which characters didn’t need to be fleshed out or interesting in any way. The emphasis was always on the whimsical adventure itself. So the Batman of the cartoons remained, without hope of change, an affable, all-American, lacrosse playing, wise-cracking, older brother type of Scout leader. And that’s really not what we want to talk about, is it? -world. Tim Burton’s take on Gotham’s Night; itself directly a result of the efforts of Frank Millers works Batman: Year One and The Dark Knight Returns – is a subject for another installment. For now, suffice to say the idea was to put Batman in black and turn the lights out. People loved it. Bob Kane, still around and basking in the glorious success that the blockbuster had attained around the world, proudly stated that they were getting the character back to his own original version. The full implications of that statement are debatable, but the point was that a new ideal of The Dark Knight – an actually DARK Knight – had entered the zeitgeist. And one man was poised to take this new idea to true immortality. That man is Bruce Timm. Batman: The Animated Series defenestrated its way onto screens in a way that no cartoon had managed before. Its only real competition at the time was in the form of Disney’s masterfully crafted Saturday morning shows – Duck Tales and Gummi Bears. But none had ever before tried to do a serious superhero for a Saturday cartoon. TAS (as it is usually abbreviated) was DC/Warner’s kill-shot; their master stroke; their Rosetta Stone. Quite frankly, nothing they have done subsequently has come close, and you’ll see a fair few efforts in a moment. Stylised heavily in what was dubbed “Dark Deco”, TAS had a look all its own. You could focus the success on any number of fine elements – the well-crafted, unpatronising storytelling; the consistently high quality of animation; the actual development of character and drama. Me? I want to pin it on these guys. The man on the left is Kevin Conroy. The man on the right? Luke Freakin’ Skywalker. While an animated show is, of course, really made by the team that gets behind it (and the Batman team was nothing short of an army of creative genius’), none have gained more respect or notoriety than the dynamic duo above. Respectively, Conroy and Mark Hamill (real name…as if you didn’t know) voiced the real stars of the show. Now this would be a buddy-cop show for the ages! Insert your own tag line below. It’s hard to go into discussion about exactly what about this casting worked so right. I suppose I would just have to content myself by saying that Conroy and Hamill, through all the years they have voiced their epic hero and villain, just never did anything wrong. Conroy, particularly, lends his hero an unheard of subtle darkness, and makes a poignant and sensibly voiced distinction between the Batman and Bruce Wayne (Christian Bale would have done well to take lessons). TAS ran for three brilliant seasons at WB. But the real testament to its quality is in the fact that, come the end, the series was not cancelled, but rather matured into something bigger. 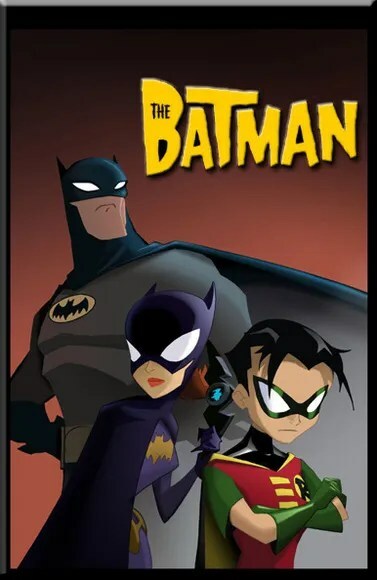 In order to incorporate an expanding base of supporting characters, most notably the young Robin, TAS carried the stories and continuity into a new show: The Adventures of Batman and Robin. There was no change in tone, however, as Batman was still a very dark and brooding avenger of justice, cloaked in shadows and confident in his ability to solve most problems by punching them into submission. This show featured Bats and Supes as major players, but teamed them permanently with Green Lantern (John Stewart), Wonder Woman, The Flash, Martian Manhunter and Hawkgirl. Awesomely while the cases and conflicts escalated to include alien invasions and world-conquering despots, Batman himself remained grim and mysterious – a source of anxiety to his colleagues who could never quite get a read on him. Figuring that the stage just wasn’t big enough, Justice League mutated into the acclaimed Justice League Unlimited which saw a staggering cast of more than 150 characters, with more than 50 appearing in the first episode alone! Through it all, the assembled heroes looked at Batman with a wary eye at times, afraid that if it came to war amongst themselves, he would somehow take them all out. During this period of uninterrupted success, the “powers” decided that Batman still needed his own space to shine – but why did that have to mean Bruce Wayne? With Kevin Conroy still lending his talent, a story was crafted about Gotham City of the future, in which an elderly Wayne can’t carry on as his city’s protector, but his brand-new protegé, Terry McGinnis, is more than ready to fill his cape. Batman Beyond (or Batman of the Future which sounds less awesome) ran from ’99 to 2001, and amazingly was every bit as well received as TAS. The show, depicting a dark and difficult future for the world, still existed in the same timeline as TAS and Justice League Unlimited (as well as the made-for-TV series Static Shock…also brilliant). For a mind-blowing 15 years, the animation teams at Warners crafted a complex, interesting and engaging series of stories about a world – no, a universe full of heroes. And through it all the characters were consistently interesting and compelling… and Kevin Conroy proved that we would listen to him read the phone book in that voice. Unfortunately all good, and great, things must come to an end, and while fans would continue to have the pleasure of the Conroy/Hamill double team in the fantastic Arkham Asylum games, the screens would no longer play host to the adventures of this Caped Crusader. For four years (’04-’08) viewers were instead treated to a new idea – something of a punk version of Gotham as a young and inexperienced Batman established his reputation. The Batman was an all-new effort to draw in young viewers for another – hopeful – 15 year run of adventures. While the new animation style and innovative characterisation of villains was novel in concept, the series never saw the success of the franchise previous incarnations. The “new” Batman, voiced by Rino Romano, seemed to be trying a little too hard to be intimidating, and wound up posturing to a collection of (presumably) steroid-enhanced foes. Another new solution was needed, and it came in the form of a complete 180 from efforts of the past 20 years. Batman: The Brave and the Bold was an experiment in bringing a Silver Age comic gimmick to Saturday morning. The original book featured Batman as the sole recurring character, while each issue would team him up with a different DC hero for a brand new adventure (or case… this Batman was still too serious for “adventures”). The series attempted to use this hook (which could lead to new series for popular guest stars. Smart business folks) along with a nostalgic reverence for a… less dark Dark Knight, once again. I can hear the K’POW just looking at it. Teaming up with the likes of Green Arrow, Wonder Woman and even the Blue Beetle were pretty standard super-fare. But Brave and the Bold put the Bat in touch with supernatural cowboy Jonah Hex, immortal rhyme-talking demon Etrigan, and DC’s sentient piece of silly putty, Plastic Man. The situations were much too far-fetched to be taken seriously, and so the show ran on a good deal of humor as well as polished action and adventure. Batman – not laden here with his secret identity – was voiced by Diedrich Bader, and if you don’t know who he is, take a moment to check IMDB, and then let your mind be blown as you consider what an awesome idea that is. But this series, along with most of the previous tv and even film incarnations of Batman, suffered a common and inescapable problem: None of them were Kevin Conroy. He can get away with saying it: Christian Bale’s a Big Girls Blouse. And so the future of Batman lay not in TV… but you already know that. Next time we look at Batman’s journey from light to Dark, and meet the artists who have perhaps brought the strongest sense of personal vision to the franchise. Check back next week for Part 4. From memory i caught the second episode of TAS. A friend came over and was raving about this new Batman Cartoon. When i saw it, it was just amazing. The type of show where you would sit in Bed, eating pop tarts and watch it on Channel Nine. It used to come on around 10.30am. The last of the Saturday morning cartoon shows for me!